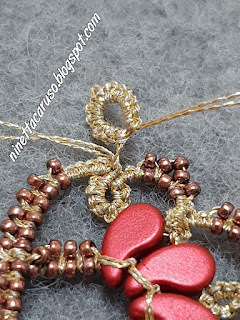 I added a lanyard to the pendant showed in previous post, but this time I played a little, adding treble tatting stitches. 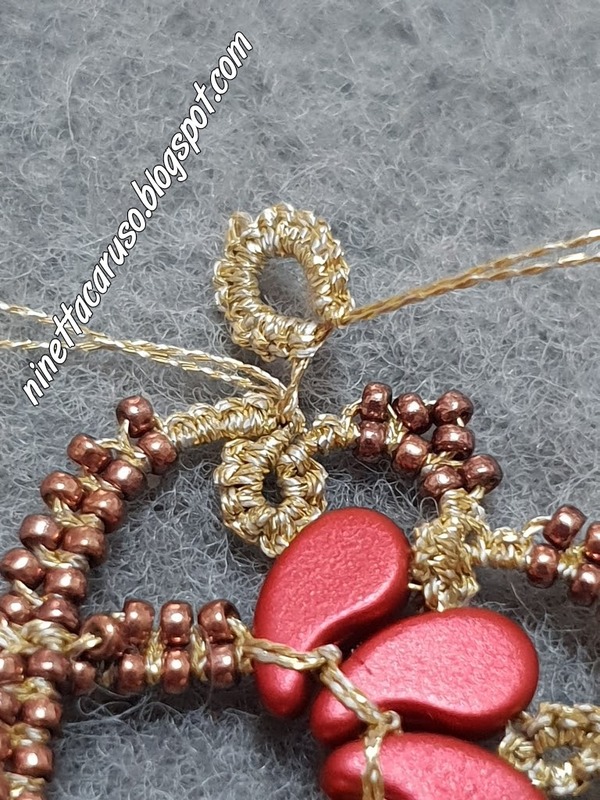 Of course this lanyard (with or without beads) can be used also to tat bracelets or bookmarks' tails or eyeglass necklaces holders. For the previous necklace, I tatted all split rings, with beads. You make the loop around your hand with 2 beads in the loop, then, before tatting the second side, one bead is moved in the starting point of the split ring, while the second bead is trapped at the base when you close the split ring. Beads are pre-loaded in shuttles. 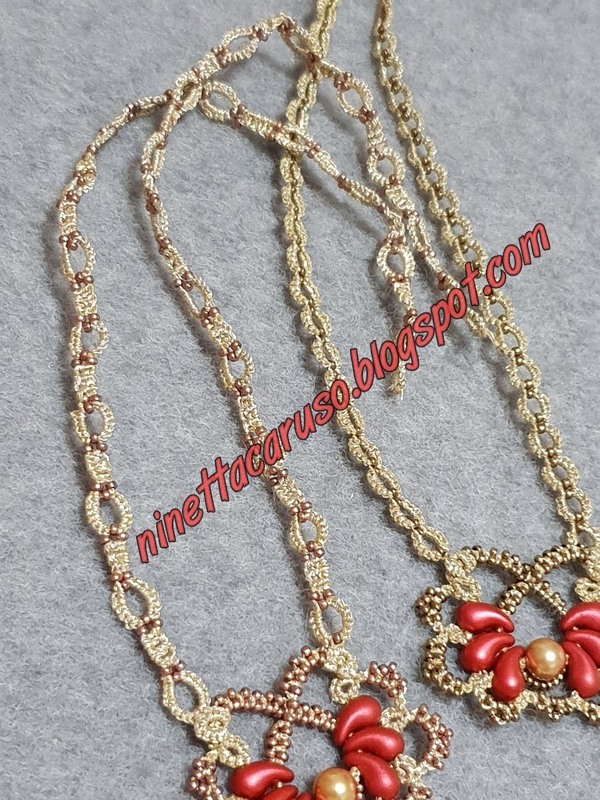 The two detached lanyards are connected to the pendant with 2 curled rings of 8-8 double stitches (that is 8ds, very small picot, 8ds). Actually, you see from last pic, in last post I lied 🙇🙇🙇... 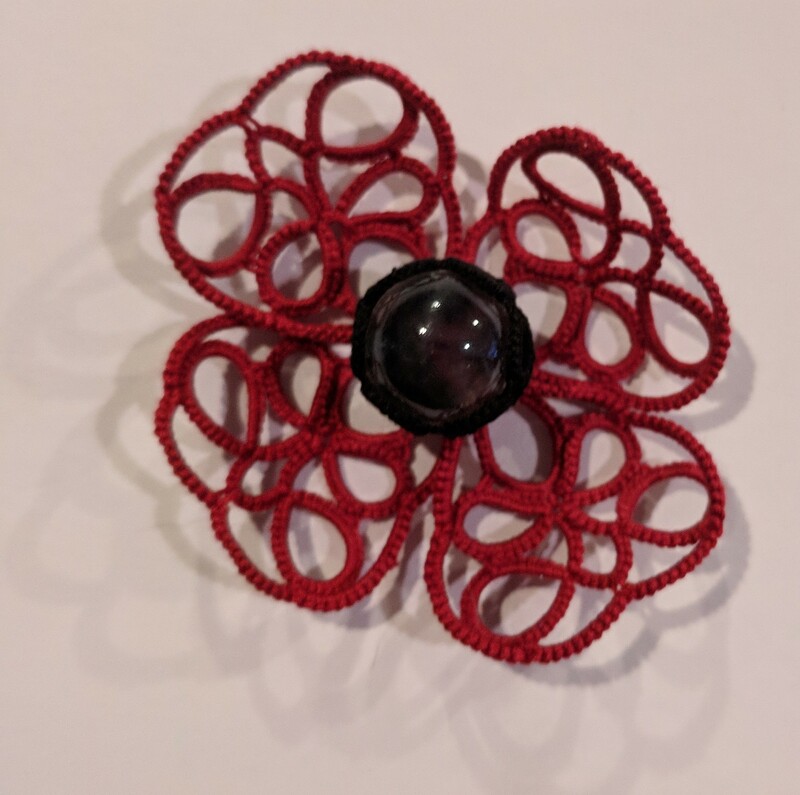 I didn't cut and tie and hide the two ends of thread at the end of the pendant... 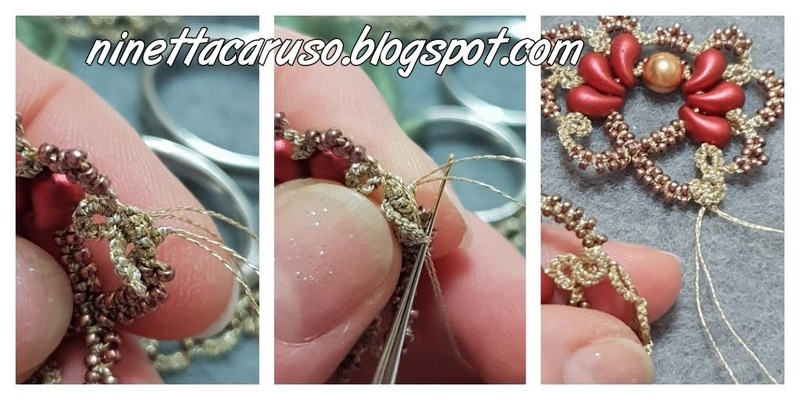 Instead, I tatted the ring 8-8 double stitches, leaving a very small bare thread space, then I curled it and blocked that ring in position, over the last chain tatted in the pendant, being careful to hide the second thread tail "inside" the curling. In that way, I already had both shuttles ready to start the lanyard on that side. The other side lanyard has to be a fresh new thread. Well, I thought, I could have fun, changing the all split ring line with something different, and - why not? - with treble stitches! 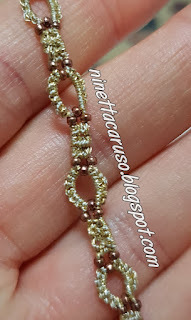 I tatted a sample without beads and with two colours, so I hope the pattern is more clear than the tatting with that gold thread used for the pendant. 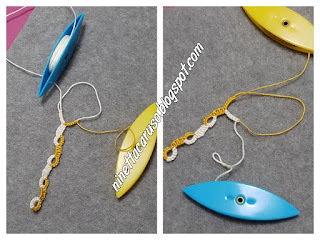 Pattern: start with two shuttles and tat a ring (or you can start with a split ring). My split rings are 8double stitches each side. Reverse work (I reversed work after each split ring). 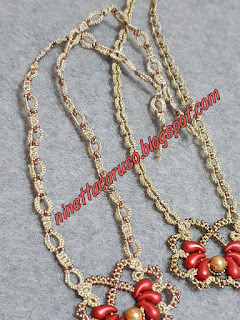 Exchange shuttles and tat a chain of 3 treble stitches. Then do not reverse work and use the ball shuttle to make the loop around your hand and tat the next split ring. Close that split ring and reverse work (in this way, also shuttles are exchanged), then tat again a chain with 3 treble stitches. Go on till you reach your desired length. If you, like me, want to add beads, I did it in this way: beads in split rings are put exactly in the same way I did in the previous - only split ring - necklace. Then, before starting the chain with treble stitches, slide one bead from the core shuttle and another from the "ball" shuttle, then tat the chain and before starting the next split ring, do the same, sliding one bead from the core shuttle and another from the "ball" shuttle. The trebles work well for the lanyard because they’re ‘substantial’, thumbs up. I love the lanyard - now I need to learn that treble stitch! Thank you very much Cindy! You are so very creative!!! And must be a fast tatter too!! The idea of using trebles in lanyarn is wonderful, it may help the lanyard for not to twist. The treble lanyard looks much better than the 'boring' SR one & for some reason it reminds me of a mangalsutra.